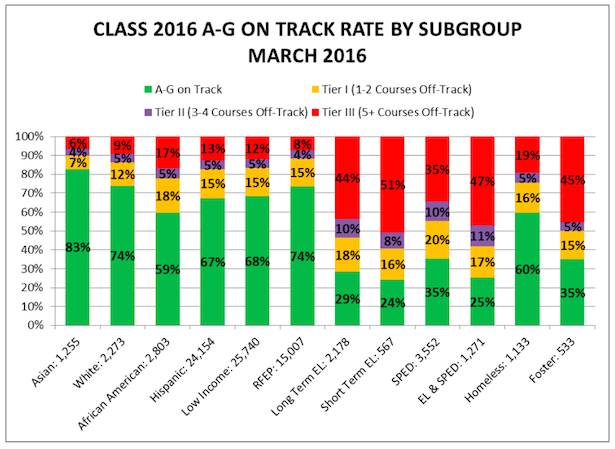 LAUSD report on A through G completion rates. There is a wide gulf of disparity when it comes to the performance of races and subgroups in LA Unified’s A through G completion and graduation rates, but these groups have come a long way and are doing better than ever before. Recent district reports breaking down the graduation rate as it heads into the final six weeks of the school year show 68 percent of seniors are currently on track to complete their A-G courses with all D’s or better. A-G completion is a key component required for graduation and is being implemented for the first time this year. The courses are required for acceptance into California’s public universities, although C’s are needed to qualify. Due to a $15 million credit recovery program that has signed up thousands of students to retake courses after school, on weekends and over holiday breaks, the district has predicted the graduation rate could rise as high as a record 80 percent. But peeling back the layers of the 68 percent mark reveals other numbers that are troubling yet familiar, as African-Americans, Latinos, English learners, foster students and students with disabilities are far behind their peers on A-G completion. Despite the disparities, the district has made big strides over the years when it comes to race and subgroup performance. According to a UCLA report from 2013, 21 percent of African-American high school students were on track with A-G courses in 2008, compared to 59 percent today. Latino students had a 24 percent on track rate then, compared to 67 percent today. English learners had an overall 9 percent on track status, compared to 29 percent for long-term learners and 24 percent for short-term learners today. Asian students and white students, who are outpacing their peers today, have also made significant strides. Asians have gone from 58 percent on track in 2008 to 83 percent today, and white students have gone from 45 percent to 74 percent. Overall the district had made progress in all students who are getting C’s or better in all A-G classes, from 18 percent in 2005 to 48 percent as of March 7. When asked about the low performance of African-American students on A-G, LA Unified Chief Academic Officer Frances Gipson said the district is taking various steps to help those students and new data coming soon will show that more African-American students from LA Unified are getting into college than ever before. LA Unified school board President Steve Zimmer at a recent board meeting said the district is focused on bringing more equity to all its students. “I’ve said this before and want to continue to emphasize that we are striving to bridge the education gap between the haves and the have-nots and give every student a path to quality education and graduation. That remains the civil rights struggle of our day,” he said. The district’s 141,000-plus English learners remain among the biggest challenge when it comes to A-G because some of the courses essentially require English fluency.